Thursday is the start of a major four-day event for local outdoors enthusiasts. The top names in competitive bass fishing will travel to the Red River to compete in the final showdown of the FLW Tour with the Forrest Wood Cup Champion Aug. 15-18 on the Red River. Hosted by the Shreveport/Bossier Sports Commission and LouisianaTravel.com, the tournament will feature 46 of the world’s best bass pros and co-anglers casting for the sport’s biggest award – $500,000 cash in the pro division and $50,000 cash in the co-angler division. The Shreveport-Bossier Convention and Tourist Bureau is hoping to set a record with spectators visiting the area. They’re aiming for 80,000 admissions at all combined events. “We won’t know until afterwards how we do, but (the goal) would be record setting. But having seen what happened at Bassmaster Classic, we’re optimistic and working our tails off to make it happen,” said Chris Jay, Public Relations & Social Media Manager for the convention and tourist bureau. Anglers will take off from Red River South Marina located at 250 Red River South Marina Road in Bossier City, at 7 a.m. each morning. Weigh-ins will be held at the CenturyLink Center located at 2000 CenturyLink Center Drive in Bossier City, beginning at 5 p.m. daily. “I would encourage people to try out the weigh-ins because it’s not a sleepy event where guys are pulling fish out of a sack — it’s the equivalent of a rock concert with live music, lights, celebrity appearances. It’s exciting,” said Jay. Fans will also be treated to the FLW Expo at the Shreveport Convention Center located at 400 Caddo St. in Shreveport, on Friday, Saturday and Sunday from 10 a.m.to 4:30 p.m. prior to the weigh-ins. The Expo includes Ranger boat simulators, the opportunity to interact with professional anglers, enjoy interactive games, activities and giveaways provided by sponsors, and fans can learn more about the sport of fishing and other outdoor activities. On Saturday and Sunday, 500 free rods and reels will be given away each day to the first 500 children 14 years and under who are accompanied by an adult. “The Expo is going to be tremendous fun, it’s not just shopping — there are going to be demonstrations, chances for kids to fish, and don’t be surprised to bump into legends of the sport. There is a lot that, especially, a parent can get out of this,” said Jay. All activities are free and open to the public. A free shuttle at CenturyLink will be circulating every 15 minutes between the Expo and the weigh-ins. Kelly Wells, President of the Shreveport-Bossier Sports Commission, said their efforts have been a year-long task to make sure all goes smoothly for the anglers and the public. 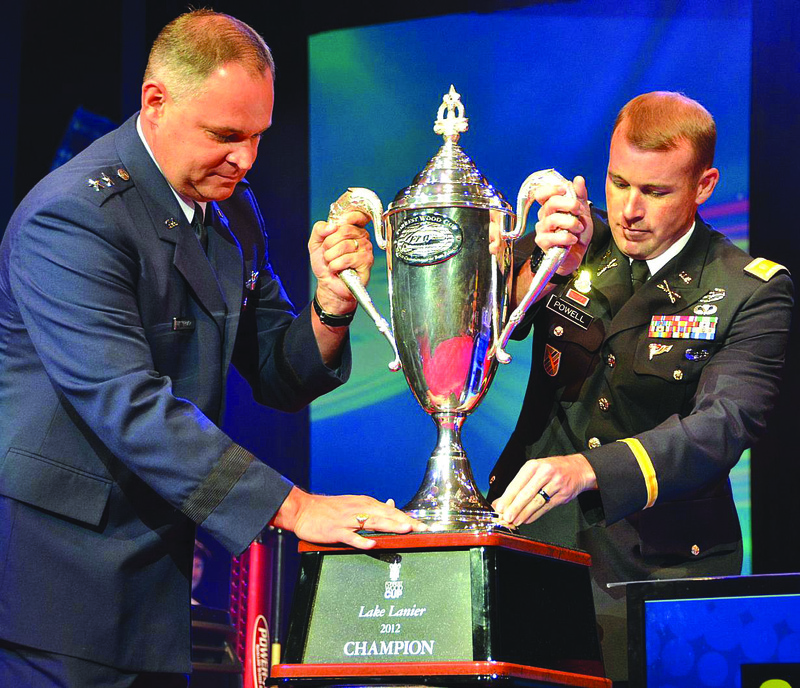 The Forrest Wood Cup was started July 24, 1996 by Irwin L. Jacobs, as a way to help the sport of bass-fishing to grow. He renamed the tournament the FLW Outdoors after Forrest L. Wood, the founder of Ranger Boats. It includes circuits of organized tournaments where bass anglers of all skill levels have the opportunity to compete for millions in cash prizes. Each year, there are roughly 200 tournaments which contenders compete in. There are also five fishing circuits which include the Wal-Mart FLW Walleye Tour, EverStart Series, Wal-Mart Bass Fishing League, National Guard FLW Walleye Tour and National Guard FLW College Fishing.